What is it about sticks? It seems everybody likes them. Dogs like 'em of course. Jasper and Lilah, sticking together. Pun intended. But people have been known to play with sticks as well. 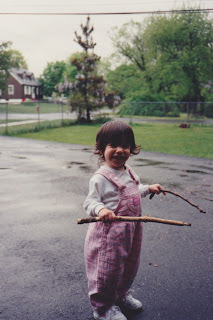 When my daughter Corinne was little, she had a pet stick. To anyone who has young children, it would come as no surprise that she named it Stick. Every time we went outside, Corinne wanted to walk around with Stick. Just holding it. 'Cause that's what you did with Stick. You held it. Though she wanted to bring it inside, I was able to convince Corinne that Stick would be happy in it's wagon bed in the garage. 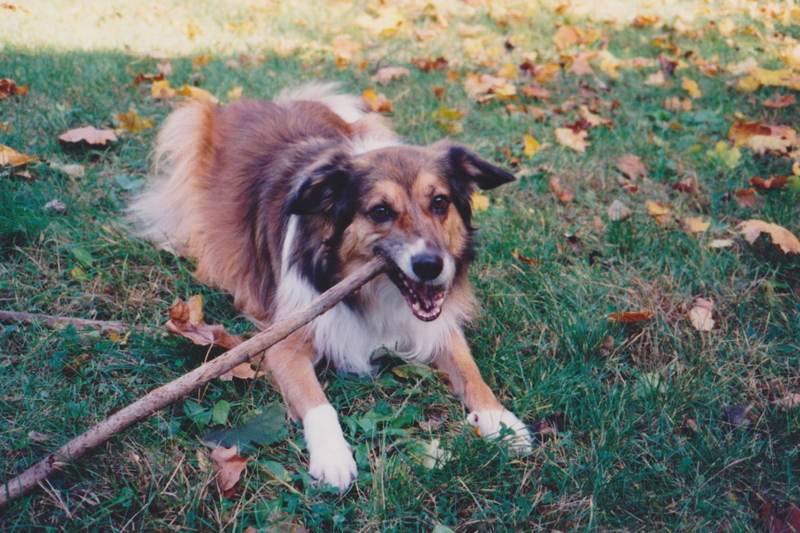 There was a slight issue, though, because our dog at the time--Kelsey--liked sticks, too. And she really could not tell the difference between uppercase, proper noun Stick the pet and the lowercase, garden-variety, tree debris type stick. This led to several disagreements that often resulted in tears on the part of Corinne, and a quick sleight of hand switcheroo that allowed Kelsey to play with a generic, unnamed stick. Corinne and Stick. The official Stick is in her right hand. The other one is a generic stick for Kelsey. And it's not just little kids that play with sticks. 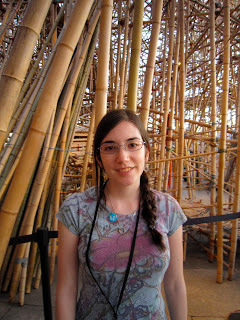 Last year, Brian, Corinne and I went to see Big Bambu, an art installation on the roof of the Metropolitan Museum of Art in Manhattan. (It's worth clicking on the link to see the pictures.) 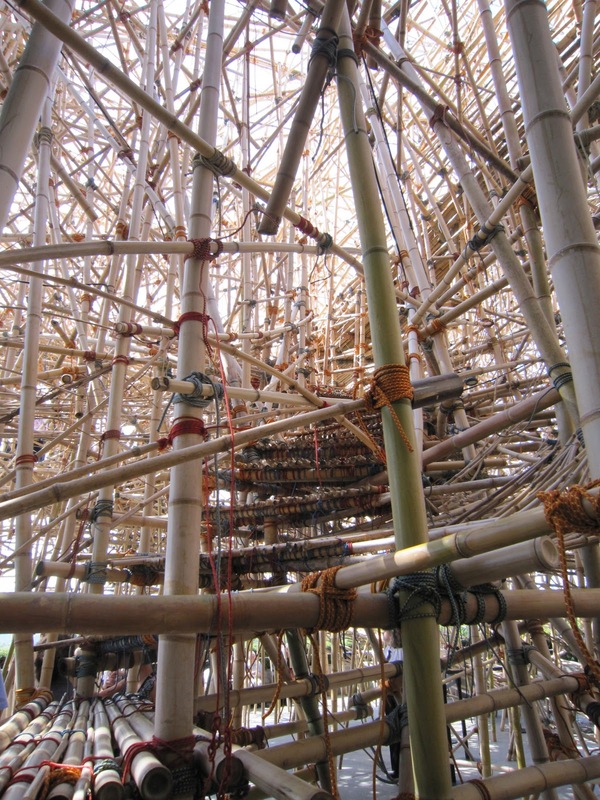 Constructed of bamboo, this huge piece was designed and built by Mike and Doug Starn, along with a team of experienced climbers. The art was in the doing, and visitors were able to walk around--and eventually through and on top of--this incredible interactive sculpture--even while it was under construction--and deconstruction. Stairway to heaven...on sticks. The path through Big Bambu. 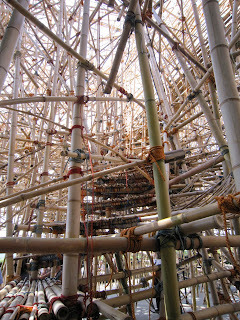 We were lucky enough to get on a guided walk through Big Bambu as sunset bloomed over the city. Cameras weren't allowed within the exhibit (too many opportunities to drop them on the other art lovers below), but it was quite magical. 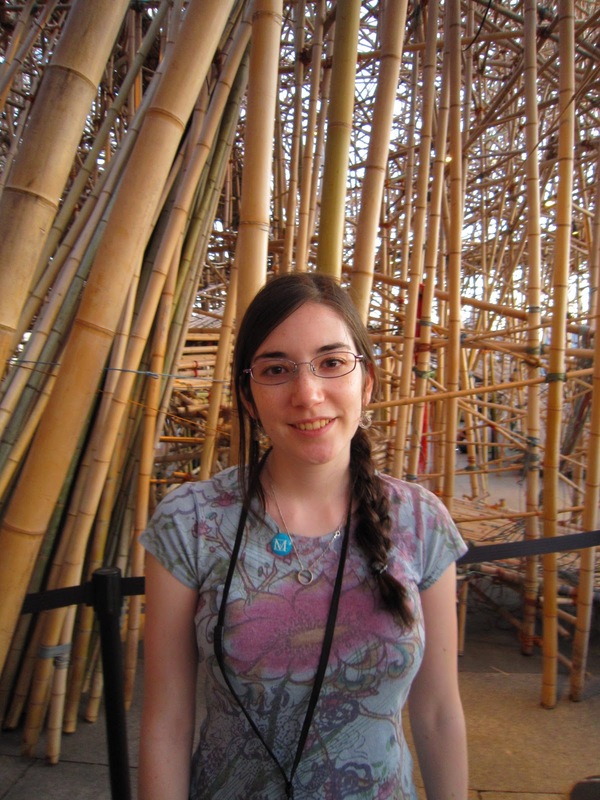 Corinne, surrounded by sticks, at Big Bambu. A grown-up Corinne loved it. I guess I shouldn't be surprised. And even I have had the pleasure of working and playing with sticks. 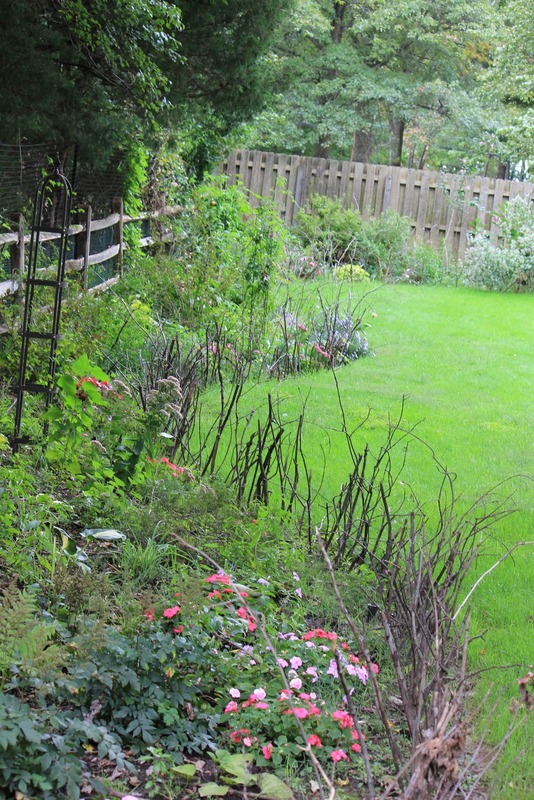 Since more than half of our property is woods, there were plenty of branches, limbs and twigs for me to create a visual barrier to my perennial garden. My goal was to keep the dogs out; only partially effective, it still added an artistic, rustic feel to my flower bed. 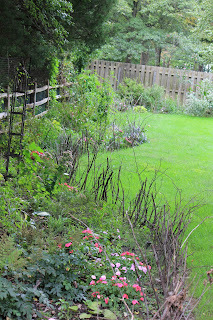 My garden, with its natural stick fence. But in the end, sticks really are The Best Things for Dogs. 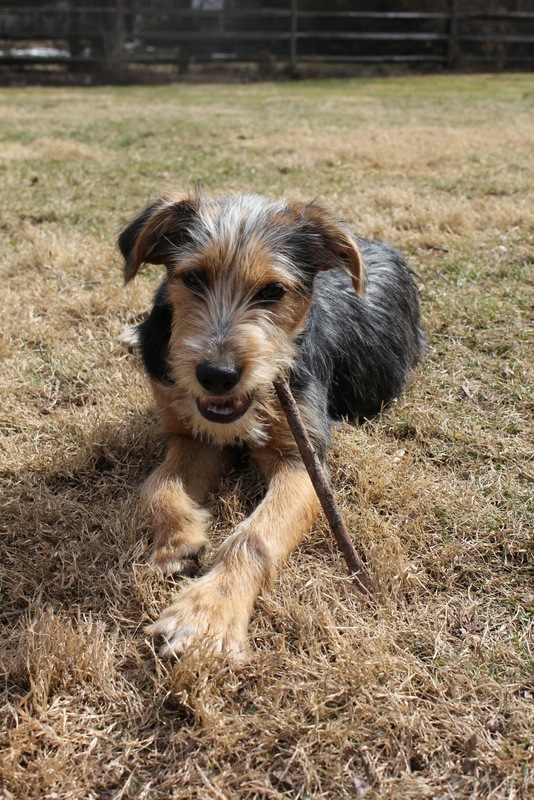 Tucker looks like he's smoking a pipe, but it's just a good gnawin' stick. If you're not busy chewing on a stick, you can just walk around with it. Or run around with it. 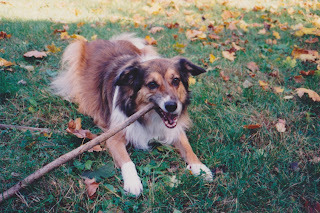 Kelsey used to love to carry a really long stick and then sprint toward her people, in an attempt to run between them with it. She never quite got the concept that the stick was wider than she was, so her errors of judgement often resulted in two humans being slammed in their calves, and a stunned Kelsey who didn't understand what stopped her so suddenly. We all learned to pay close attention when Kelsey was Carrying a Big Stick. A stick in the snow is lots of fun, too. When people throw it for you, sometimes it lands in a way that points up--and other times you have to dig for it, which is even more exciting. The best sticks are the ones you remove from the snowman and snow lady. How nice of Mom to make them so accessible and easy to find. 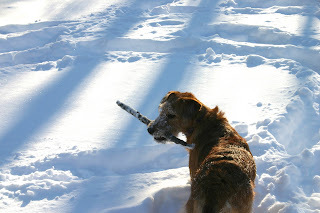 Rosie and her stick in the snow. Eventually, she'd ask us the throw it, but it was fun to Run Mucks first. There's a whole process, by the way, to finding the perfect stick. The recent fall snowstorm left our yard littered with humongous piles of branches just waiting for the right dog. Many of them still had leaves on them, which are, to some, extra special. To find the right stick, you need to assess the inventory. Once you decide which one you want, you have to Get It. Which might mean pulling it off a larger branch. Tucker puts all his weight into getting the right stick. You can always see if the large branch itself has possibilities. Lilah considers a large branch. Tucker looks on, in case he would like it, too. Even a large piece of bark has potential--stick potential and pun potential, though the dogs didn't really appreciate the latter. Tucker and Jasper discuss ownership of a bark. I believe they both own pretty impressive barks. 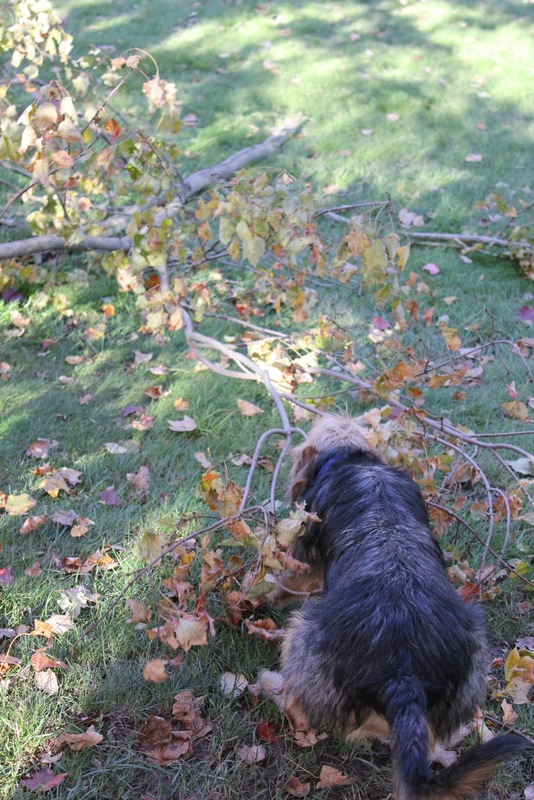 So many huge limbs fell during the snowstorm, that, as a dog, you just had to try to get The Big One. Just once, at least. Tucker chews on a huge limb. Or if you were Lilah, who we've always felt is part cat and part goat, you could just walk on the big stick. Lilah is so proud of herself, walking on the giant branch. Jasper seems a little worried. But that's his normal state: a little worried. Or use it as a springboard to leap over your brother. All the agility practice pays off as Lilah leaps over Jasper. Picking out the best stick takes strength and skill. Tucker and Jasper choose sticks from the same pile. Sometimes, it's best to do a test gnaw while the stick is still attached to the rest of the branch. Lilah testing out the chewability of a possible stick choice. Once you found your stick, it's best to run around the yard and show the other dogs that you have the Best Stick and they Do Not. More then likely, one or the other of them will try to Get Your Stick. But they have to catch you first. Which is probably the point. I have a Stick and you don't. Now try and catch me. Lilah and Tucker play Stick Keep Away. Though sometimes, it's okay to share the stick, if it's long enough. And sometimes it's not okay. Then there's a growly discussion about Stick Ownership. Jasper and Lilah disagree over the Rightful Owner of a particular stick. Or sometimes just a staredown at the two ends of the stick. Though if you find a stick with lots of branches to it, there's more than enough to go around. Tucker and Jasper companionably share a multi-branched stick. Even three dogs can sometimes share one stick. That usually doesn't last long, as someone will eventually claim it as his or hers. Three-way tie: Jasper, Lilah and Tucker each claim the prize. And the victor takes off with her prize; the other two in hot pursuit. One of my favorite picures; Lilah runs with a pine branch, with Jasper in hot pursuit. Tucker is looking to join in as well. Ah...the joy of the chase! Below is a 5-second video of Three-way Stick Tug; the first video I've attemped for this blog.